John Taylor, my hero from Loving John – Book 9 of my Tarnished Saints Series is by far one of the more adventurous of the Taylor Twelve brothers. He’s a dog sled musher – with a dog that happens to like deviled eggs. I’ll let him tell you about it. John: My lead dog, Lucifer is crazy! He not only has one blue eye and one orange eye, but runs like the devil, pulling my sled and leading my team. That’s one of the reasons I named him Lucifer – the other is because he likes deviled eggs. My mother taught me this recipe when I was just a child, and I love to make it. 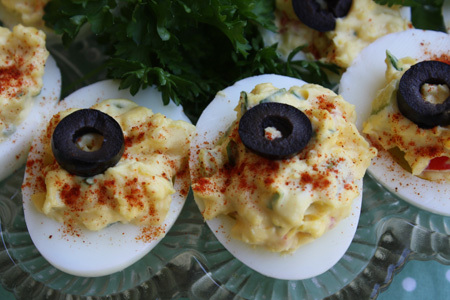 One day Lucifer got into the deviled eggs and loved them – so I named him after the devil. I can’t make deviled eggs without giving him a few or I’ll have hell to pay – excuse the pun. This is a fast and easy recipe, if you’re having the guys over to watch the game, or you just want to impress a girl with the fancy way these look. Here’s how you make them. Start with more eggs than you need since sometimes while peeling them they get gunked up. Boil 8 – 10 eggs and let them cool. Then peel them, and cut in half, putting the yolks into a separate bowl. Chop up the yolks and add enough mayonnaise to make them creamy. Chop up a half a stalk of celery – small, and add to mixture. Mince one clove of garlic and add to the mixture. Chop 1/2 jalapeno (optional) and mix in for a little extra kick. Spoon the mixture back into the whites of the eggs and sprinkle with either paprika – or if you like spice in your life, a little cayenne. Top off with chopped parsley and a slice of a black olive. There you have it – a quick and easy snack that anyone (or my dog) will love.